23:00 - Ghosn arrives at a hotel in Tokyo. 20:10 - Ghosn leaves his lawyer's office. 19:20 - Ghosn needs to recuperate now and will consider holding a press conference at a later date, defense lawyer says. 17:40 - Ghosn arrives at the office of his defense lawyer. 17:37 - Ghosn has no plan to hold a press conference Wednesday, defense lawyer Junichiro Hironaka's office. 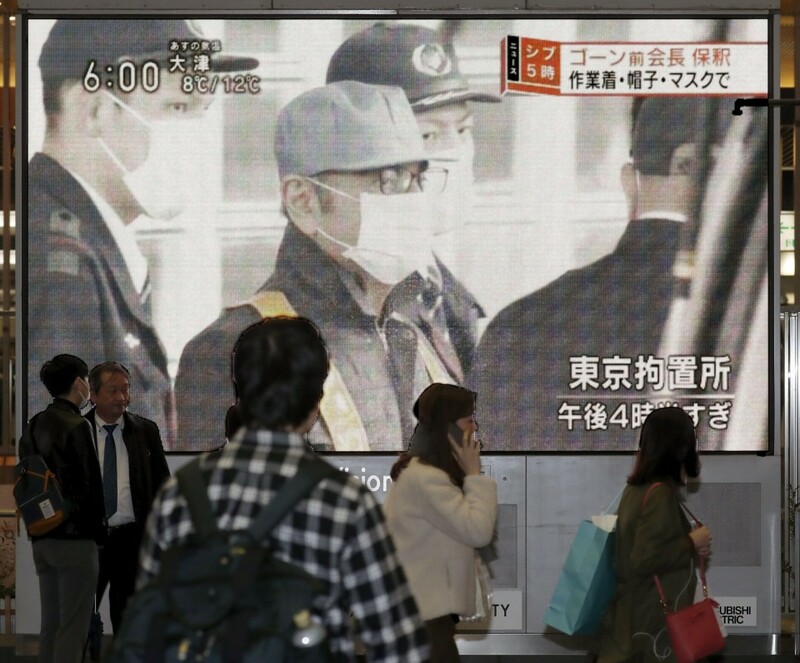 17:00 - Vehicle carrying Ghosn travels through downtown Tokyo, chased by motorcycles and a helicopter. No information available about where it is heading. 13:42 - Ghosn pays 1 bil. yen in bail money, his release expected Wed.
10:52 - More than 100 reporters gather in front of Tokyo Detention House. 16:35 - Japan gov't spokesman Suga mum about court's decision on Ghosn's bail. "Any individual issue would not affect Japan-French relations." The following is a chronology of major events related to Carlos Ghosn, former chairman at Nissan Motor Co., Renault SA and Mitsubishi Motors Corp.
October 1996 -- Ghosn joins Renault SA. March 1999 -- Nissan, Renault sign capital alliance. June 1999 -- Ghosn becomes Nissan's chief operating officer. June 2000 -- Ghosn becomes Nissan's president. June 2001 -- Ghosn doubles as CEO and president of Nissan. June 2003 -- Ghosn takes up post as Nissan's co-chairman. May 2005 -- Ghosn becomes CEO of Renault. June 2008 -- Ghosn also takes up post of Nissan's chairman. May 2009 -- Ghosn doubles as CEO and chairman of Renault. May 2016 -- Nissan agrees to bring Mitsubishi Motors under its wing. December 2016 -- Ghosn becomes chairman of Mitsubishi Motors. April 2017 -- Ghosn resigns as Nissan president and CEO, succeeded by Hiroto Saikawa. Ghosn retains post of chairman. Nov. 19, 2018 -- Ghosn is arrested by Tokyo prosecutors on suspicion of understating remuneration in Nissan's securities reports during five years through March 2015. Nov. 22 -- Nissan's board dismisses Ghosn as chairman. Nov. 26 -- Mitsubishi Motors dismisses Ghosn as chairman. Dec. 10 -- Ghosn is indicted on charge of violating financial instruments law. He faces fresh arrest warrant over remuneration underreporting that is suspected to have continued through March 2018. Dec. 21 -- Tokyo prosecutors serve fresh arrest warrant on Ghosn on suspicion of aggravated breach of trust by transferring his personal investment losses to Nissan. Jan. 11, 2019 -- Ghosn is charged with aggravated breach of trust and understating his remuneration for three years through March 2018. Ghosn's defense counsel requests his release on bail. Jan. 15 -- Tokyo court dismisses Ghosn's bail request. Jan. 22 -- Tokyo court denies Ghosn's second bail request. Jan. 24 -- Renault board names new CEO, chairman to replace Ghosn. Feb. 28 -- Ghosn's new lawyers file another bail request. March 5 -- Tokyo court approves bail request for Ghosn.